From the moment we landed in Bali we felt this sense of calm wash over us. There was a different kind of energy here- something much more relaxed and peaceful than that of Thailand. You could even tell from the nature of the Balinese people as they are always seen smiling and so relaxed and happy it made us feel so welcome! The villa we rented resided in Canggu, a relatively new area of Bali (that didn’t even exist when I was here 8 years ago) but is now booming. It is an extremely popular place amongst digital nomads as there are tons of co-working places popping up with good wifi and amazing cafes to work from which is one of the reasons we ended up here. Our 3-bedroom villa was located just a few minutes’ walk from the main beach and a 7-minute walk from all the restaurants on the main strip, we really couldn’t have lucked out with a better spot! Our villa also had its own private pool where we spent many days soaking in the sun or tossing a ball around in the pool! We had a cleaner who came to our place every day for 2 hours who was one of the sweetest women we had met. Her name was Endang and she worked harder than I think anyone we’d ever met and the thing that amazed me the most was that she was always happy. She would pick us up fresh fruit every other day before she came and refill our large bottles of water when they were empty, and she was always smiling. The crazy thing to us was that her wage per hour was $3 (CAD) and that is considered a good wage in Bali! We tipped her at the end of each month, and she cried both times and didn’t even want to accept the money. It was a very humbling experience to speak with her. She told us that she saves up all the money she makes here and sends it back home to her parents and her 2 kids (who live 6 hours away) and who she only sees a couple of times a year. Apparently, this is common for Balinese women to live a lifestyle like this and it made us very grateful for the life and opportunities we have. The streets around Canggu are busily packed with scooters and motorbikes with tons of brand-new drivers trying to navigate the busy roads. We’ve seen many near collisions around the area and that many more people with bandages from road rashes, that we choose to walk or grab a very cheap “uber” to our destinations. The “ubers” are crazy cheap and often cost us $1-$3 to go 10-15 minutes. They often take us down the infamous shortcut route through the rice fields which is an interesting experience. Nearly everyone seems to take the shortcut although most people really shouldn’t. It’s an extremely small narrow road, not wide enough for 2 cars and because it is cut through the rice fields the road is actually elevated. So, as I’m sure you all can guess that a road that should be a one way but isn’t- when cars come from both directions and realize they can’t fit often one ends up in the ditch. And not just cars, motorbikes also end up falling over the edges as well. We’ve been lucky enough not to experience it first-hand but we did see a car in the ditch on one of our routes and were also warned about a big truck that went over and held up traffic for hours. 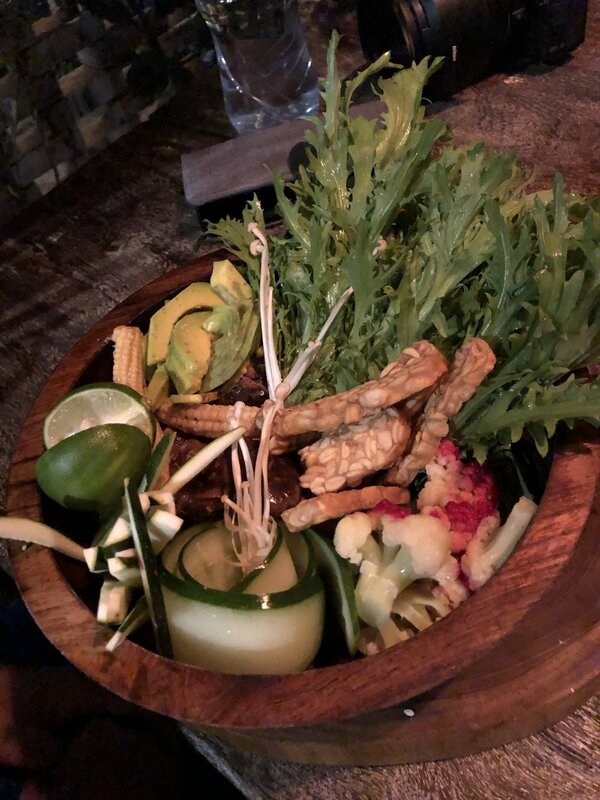 Our first month in Bali we made a pact to do a bit of cleanse and focus on eating healthy and working out. 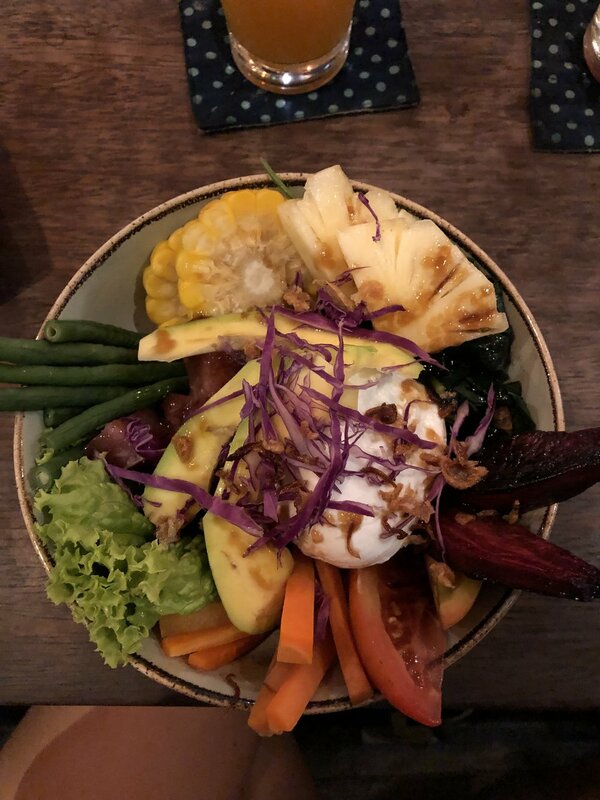 Being in Canggu made it extremely easy to eat healthy as there are so many incredible cafes and restaurants offering just that. We decided to take it one step further and cut out meat for the month to see how our bodies would feel. Bali in general is extremely vegetarian friendly so there was an ample amount of options to ensure that we were getting our protein which included tofu, tempe and tuna. We did still continue to eat fish and having the ability to eat fresh fish from around here was incredible. Some of our favourite dishes included a lot of raw tuna (sashimi-like) that literally just melted in your mouth or a nice seared tuna in a glaze over rice. Everything just seemed so fresh and our bodies were craving greens and healthy juices and smoothie bowls which are so easy to find here! Somehow every meal we got looked so photo worthy and instagrammable! To eat out the food here is actually relatively cheap. For a decent meal like the tuna mentioned above (no drinks) you pay between $5-$10 for a plate, whereas the same plate back home would be around $20. Local Indonesian food that you get from local restaurants called “Warungs” are usually much cheaper and can range anywhere from $2-$5 for a plate of Nasi Goreng (noodles with fried egg) or Rice with a selection of sides from their buffets. Rice with a selection of vegetarian sides from their buffets. The expensive part about Bali was the alcoholic beverages, especially the cocktails. Most cocktails will run you between $10-$15 for one! There are usually 2 for 1 happy hours every day from 5-7 which helps save some money if you are expecting a big night out! Lucky for us during the first month, we also cut out any alcoholic beverages and started drinking Kangen Alkaline water again while integrating working out back into our daily routines by swimming in our pool and doing some yoga. After a month of doing this we couldn’t believe how much better, how much lighter and how much healthier we felt. Piet dropped nearly 20 lbs just like that and I felt so much healthier. We enjoyed it so much that we stuck to eating only fish and vegetarian friendly meals for the following month making us realize how little we actually missed eating meat and we plan on adopting this lifestyle as we transition back home to Canada. I do have to say though, after 30 days of no drinking we did enjoy a nice cold beer while watching the sunset. The sunsets in Bali are some of the best we’ve seen all over the world. When Canggu gets a good sunset it is nothing short of amazing. It lights up the whole sky in these orange, red and purple pink colours and can be seen every which way you look. We made it a habit to head down and watch sunset nearly every night we could. We’d walk down along the beach and find a spot to hang out and wait for the sun to go down and I don’t think we ever saw the same type of sunset. Not all of them light up the sky as clouds can roll right in and cover up the sun but when it’s clear out it’s definitely a sight to see. We loved to sit at one of the many beach bars on bean bag chairs with either a cold coconut or cold beer and watch the sun go down. Sometimes as a pre dinner snack we’d hit one of the local roasted corn on the cob vendors who have portable carts and who roast your corn right in front of you and then douse it in garlic butter. YUM! Stay tuned for part 2 of Bali where we head out and explore the island a little more!